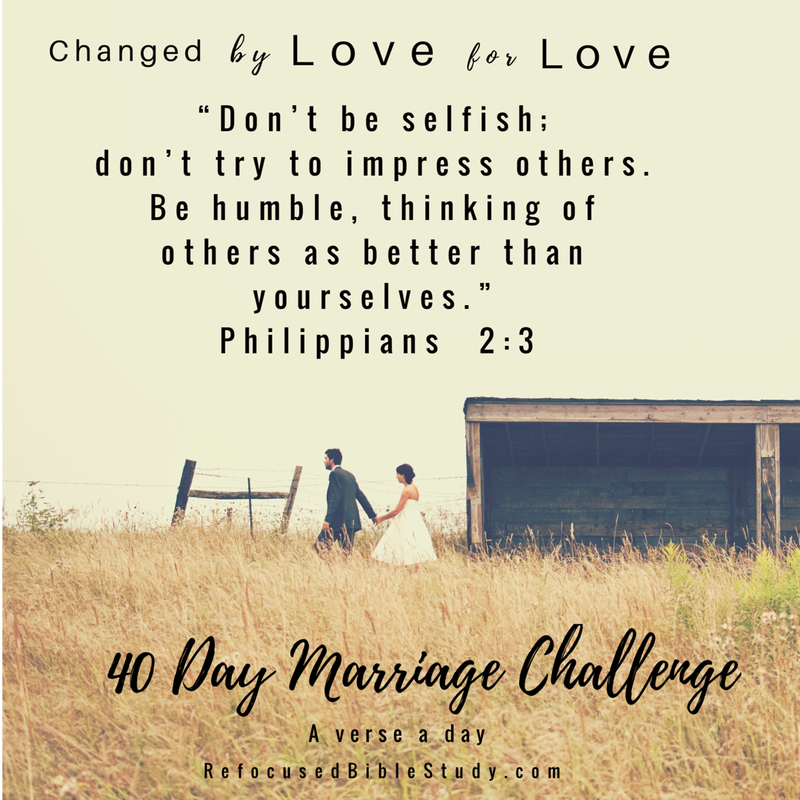 It’s Day 11 of The 40 Day Marriage Challenge! 3)Be humble – look for things in your husband you admire and respect. See things in yourself you need Jesus’ help with. Not the other way around. Recently I read a Christian an article on successful marriage that suggested you draw a circle around yourself and change the person inside of it. That is Christlike. That is what this verse is challenging us to do. To be more selfless by meditating on Christ’s selfless love for us. To desire to please God and not put our husband in a position to fill needs only our Heavenly Father can fill. To evaluate ourselves honestly before the throne of our Holy God- and to see the admirable things in our man so we deeply respect him in our hearts. E- End in prayer- Holy Father, thank you for not being selfish- and giving us your only Son. Please purify our love for our husbands through the blood of your precious Son. Help us keep looking to the cross for approval so we don’t get caught in the trap of impressing anyone. Give us eyes to see our husband’s good qualities at all times so we think of them highly from our hearts. May the enemy have no victory in us loosing respect for them. They are your dearly loved sons and we thank you for providing us with a partner for life. Bless the marriages represented reading these words.